The Oscillating Diamond Knife exclusively from Diatome! For many years Diatome diamond knives have been used successfully for a wide range of room- and low temperature sectioning applications. 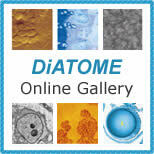 Major advances in immunocytochemistry, the sectioning of frozen hydrated specimens, semithin sectioning for optical microscopy, as well as the sectioning of hard industrial samples have been realized using Diatome diamond knives (Ref 1, 2, 3, 4). The development of the Static Line II ionizer enabled dry ultramicrotomy of Lowicryls and a considerable improvement in cryosectioning (Ref 5). The wedge angle of the knife. The hardness of the sample. The interaction diamond surface / section surface. The most critical factor is the wedge angle of the knife. It was shown that reducing the wedge angle results in a reduction of compression, hence better preservation of ultrastructure which allows a higher achievable resolution (Ref 6, 7). However, the wedge angle may not be reduced ad infinitum. A further reduction results in a lower cutting edge quality and a considerably shorter life span. An oscillating knife for low temperature applications is in preparation. 10-20% for Epon, Araldite, EM-Bed, and other epoxy resins. 10-17% for Spurr's (hard grade). 8-13% for LR White (hard grade). These limitations have stimulated our efforts to develop the oscillating knife. It has been shown that compression in frozen-hydrated sections is the limiting factor for successful electron topographic analysis (Ref 8, 9). Cryo sections from vitrified samples without compression were achieved by A. Al-Amoudi, LAU, University of Lausanne (Ref 10). The DiATOME ultra sonic, the oscillating diamond knife for room temperature ultramicrotomy. It was developed in collaboration with Dr Daniel Studer, Lab. of Anatomy, University of Berne. A piezo actuator produces an oscillation of the knife at a desired frequency and amplitude, parallel with the cutting edge. A depression in the foot of the knife allows the oscillation parallel to the cutting edge. The depression is rigid in the north/south direction and guarantees stability in the cutting direction. The new knife produces ultrathin sections almost free of compression.The sections become thinner at the same thickness setting: since the volume of the section remains the same, the increased length leads to a decrease in thickness. The theoretical considerations and first results of this invention were presented in the Journal of Microscopy (Ref 11). Results with polymers using the oscillating knife were shown at the M&M 2002 meeting in Quebec (Ref 12). Biological samples in Epon, Araldite, EM Bed, etc. Biological samples in acrylic resins (Lowicryls, LR White). Rigid polymers such as PS, PMMA, ABS, HIPS, modified PP, etc. The Gallery section includes large images with complete descriptions. Please click Gallery section. H. Sitte: Advanced Instrumentation and Methodology related to Cryo ultramicrotomy: a Review. Scanning Microscopy Supplement 10, pp. 87-466, 1996. M. Michel, H. Gnägi and M. Müller: Diamonds are a cryosectioner's best friend. Journal of Microscopy, Vol. 166, Pt 1, pp. 43-56, 1992. O.L. Reymond: The diamond knife "semi": a substitute for glass or conventional diamond knives in the ultramicrotomy of thin and semi-thin sections. Bas. Applied Histochemistry, No. 30, pp. 487-494, 1986. Various publications on materials ultramicrotomy. Microscopy Research and Technique, Vol. 31. Number 4, pp. 265-310, 1995. L. Edelmann: Freeze-substitution and the preservation of diffusible ions. Journal of Microscopy, Vol. 161, pp. 217-228, 1991. J.C. Jésior: How to avoid compression. Journal of Ultrastructure and Molecular Structure Research, pp. 210-217, 1986. J.C. Jésior: Use of low-angle diamond knives leads to improved ultrastructural preservation of ultrathin sections. Scanning Microscopy Supplement 3, pp. 147-153, 1989. C.E. Hsieh, M. Marko, J. Frank and C.A. Mannella: Electron tomographic analysis of frozen-hydrated tissue sections. Journal of Structural Biology 138, pp. 63-73, 2002. J.R. McIntosh: Electron Microscopy of Cells: A new beginning of a new century. The journal of Cell Biology, Vol. 153, pp. 25-32, 2001. A. Al-Amoudi, J.Dubochet, H. Gnaegi, W. Lüthi, D.Studer: An oscillating cryo-knife reduces cutting induced deformation of vitreous ultrathin sections. Journal of Microscopy, Vol. 212, Pt 1, pp. 26-33, 2003. D. Studer and H. Gnägi: Minimal compression of ultrathin sections with use of an oscillating diamond knife. Journal of Microscopy, Vol. 197, Pt 1, pp. 94-100, 2000. J.S. Vastenhout and H.Gnaegi: Ultramicrotomy of polymers using an oscillating knife; improving polymer morphology. Microscopy and Microanalysis. 8 (Suppl. 2) 2002. Diamond Knives and accessories can be ordered by phone at 215-412-8390 or fax 215-412-8450. 5-412-8390 or fax 215-412-8450. Sectioning tests with biological and material research specimens of all kinds. We send you the sections along with the surfaced sample, a report on the results obtained and a recommendation of a suitable knife. Complete discretion when working with proprietary samples. A re-sharpened Diatome diamond knife demonstrates the same high quality as a new knife. Even knives purchased in previous years can continue to be re-sharpened. All knives can be reworked into another type of knife for no extra charge, e.g. ultra to cryo or 45° to 35°. Whenever you exchange a knife we offer you a new Diatome. Sign up for our informative email newSletter which includes product highlights, technical tips, and product specials. Click here.